Victoria Day fell early this year. May Two-Four as it's known in some circles, is a moveable feast that occurs on the Monday before 25 May. For monarchists, it marks Queen Victoria's birthday and marks Canadian celebrations for Queen Elizabeth II's birthday. For others, the long weekend is the day cottages open, gardens are turned over, and summer (unofficially) begins. To be honest, it was hard to see last weekend as the start of the hot season. After days of warming weather and sunshine, I was reminded that I live in Canada. Days after filling my planter with twizzled corkscrew grass, bursting fuchsia, and trailing plants, the skies greyed and the wind blew cold. I've lurked in nurseries for about a month, looking for inspiration and a promise of warmer weather. I fully admit to not knowing what I'm doing in the garden and I rarely know what's in the trays and containers loaded into my cart. Whenever those green-aproned attendants ask to assist, I hand over my BlackBerry's trove of pictures of flowers and plants I've seen in other people's gardens. My soil type is dirt--the kind that has worms deep down, beyond the miner bees. The amount of light my patch receives is better predicted by a roulette wheel than experience, thanks to the condo manager's tree butchers. My garden faces front, sort of. A few weeks ago I looked wistfully at a display of hundreds of fluffy petaled flowers, their colours reminiscent of hot climate countries: blooms of saffron, cerise, beet, mango and mustard reminded me that what was under a coverlet of white, and is now a muddy brown will be alive with brilliant colours. An aproned guide whispered it was too cold to plant them. I should have bought some anyway and kept them in my dining room window. One week later those pots were gone and replaced beacons of yet-to-come frost warnings: snow white, blush white, apple white, and pallid, slightly greyed shades of lavender, lemon and underripe cherry. I left with two dahlias -- one that looked like an exploding yellow-tinged pink grapefruit, and another of the deepest and most lascivious pink. No sooner were they in the ground than I scrambled to protect my prizes from yet more frost. My neighbours are used to my eccentricities, but I'm certain I raised some eyebrows by protecting my front garden's latest inhabitants with upturned pots and basins. This weekend the extended forecast has lulled me into believing Spring frosts are history. The protective covers gone and my potted herbs and decorative containers are back in the sunshine. I don't want to have to play the protect the plants jig until autumn. But I will. If I have to. But that's this weekend, not last. Victoria Day weekend's bright, beautiful skies masqued cooler temperatures. Normally I'd keep to a simple holiday weekend menu of seared burgers, salad and fries. A Victoria sponge and fruity scones also make an almost obligatory appearance. But not this year. In my mind, it was just too cold for any of it. My mind remained with those lost sari-coloured blooms as I rummaged through my freezer. The bundle of Jacob's Ladders of beef short ribs thawed as I found some red-spined Swiss chard in the bigscarymegamart. For whatever reason, I fixated on a Korean-inspired supper. While Korea's climate strictly isn't tropical, I don't believe they endure -30C temps for weeks at a time, as we do in here in the Great White North. Feeling rather lazy and in an "it's close enough" mood, I springboarded (sprungboard?) 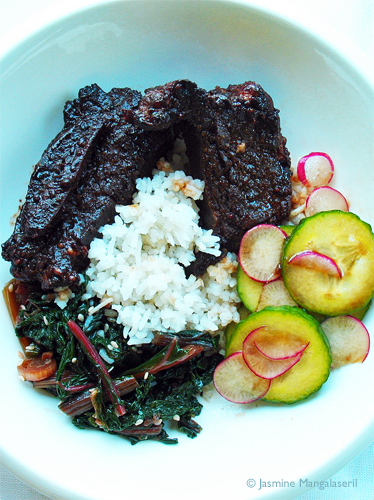 off this Asian-Style Braised Short Ribs recipe. Don't let the unexciting umber fool you--it belies a memory of south east Asia, borrowing from several territories. One of my favourite Korean side dishes is a cold, sesame'd spinach dish called "sigeumchi namul." It's just as easy to make as the the short ribs, and adaptable to any green leafy that flutters by. 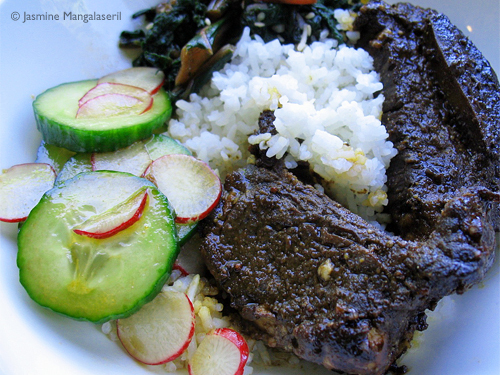 Served with rice and a vinegary cucumber and radish salad it made a rather lovely supper. Blanch the greens in salted water. After rinsing in ice water, gently squeeze out the water. Mix the garlic, green onion, soy sauce, nam pla, sesame oil and sugar. Add the greens and mix by hand. Sprinkle in the seeds and toss by hand. Let's just say these few years have been a bit of a whirlwind of change. From a new employer to being self-employed. From three furry and aged companions to two young and sprightly ones. From one less than stellar love match to another less than stellar love match. And while I spun about and danced on the latest gust of wind, my posts became perfunctory and infrequent. A glimpse here, a word there -- only a small number of recipes saw the bluey-white light of my screen, from the trove of potential posts that remain in my mind. Today's post is one of those recipes that's lingered for months. I noticed harissa began to pop up more frequently in ingredients lists, but like pretty much every other trend, I didn't pay much attention. It was the new sriracha, making it the new ketchup, making it relatively ubiquitous. At once it was commonplace and exotic. Without the time to research or make my own, I excelled at makeshift substitutions, cobbled together with what resided in my sticky-shelved pantry. Eventually, I found a bottle of it in my swanky specialty shop of choice. I was disappointed. It was bitter and bland and bit oily, which belied its "spicy" label. 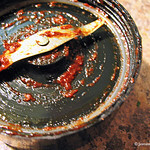 I continued to use it, spiked with the same residents from my sticky-shelved pantry. The banal was made bearable. Despite that rather disappointing introduction, I was determined to find out why so many people were enamoured with it. I found my inner Phryne and pored over books and articles. Unsurprisingly, unlike that little overpriced jar from California, real harissa is varied and complex. Like any homemade condiment, this chilli paste changes from cook to cook, some adding grilled capsicums, others use tomato passata, and still others include rosewater or citrus. My version is a combination of Paula Wolfert's harous and Claudia Roden's harissa. 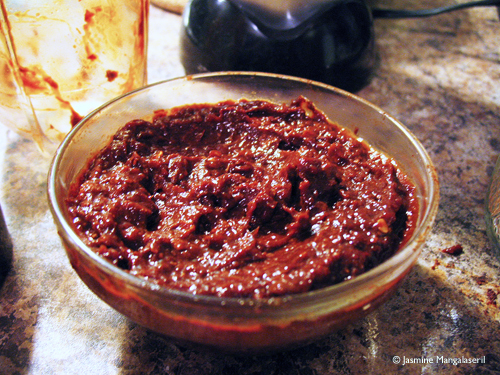 The resulting vermillion paste has a pleasing and rounded heat. While I've been known to spoon a little as a condiment with my dinner, I also use it in marinades and mix it with mayonnaise for frites or beefy sandwiches. It keeps in the fridge for weeks. Adapted Claudia Roden's harissa recipe and Paula Wolfert's harous recipe. Combine shallot with turmeric and 1tsp salt. Cover with cling and let stand at room temperature for an hour (or up to overnight). Dry toast the whole spices. Cool before grinding into a fine powder. Set aside. Rehydrate chillies with boiling water for about 30-45 minutes, until they are soft and pliable. Drain, stem and deseed before giving them a coarse grind. Add the shallots (draining, if necessary) and garlic and continue grinding until smooth. Add the powdered spices, remaining teaspoon of salt and olive oil. Continue grinding until you have a smooth puree. Balance flavours to taste. Choose whichever varietal you wish, or create your own blend from a mix of hot, sweet and smokey peppers. I used roughly equal weights of ancho, arbol, guajillo and pasilla chillies.